In Maine, you’ll find a variety of eateries serving up mac and cheese with options ranging from dishes reminiscent of home cooking and gourmet delights to dazzle your taste buds. These 10 places serve up the best mac and cheese in the state! If you love artisan mac and cheese then you will want to head straight to Five Fifty-Five in Portland for their famous truffle lobster mac & cheese. Made with butter-poaches lobster, artisanal cheese blend, black truffles and white truffle oil, you’ll think you died and went to heaven with this dish. If lobster isn’t for you, then you can get it without. No southern menu is without some good old mac and cheese. Hot Suppa is a southern-style restaurant in Portland serving up some delicious and creative comfort food. Their pulled pork mac & cheese is a local favorite. This unique twist on mac and cheese has South Carolina barbecue sauce, tobacco onions, and caramelized onions surrounded by a healthy portion of pulled pork. Yum! Mac and cheese might not be the first thing you’d order at a craft beer pub, but if it’s made with beer you will! Their mac and beer cheese dish is made with triple cheese sauce, their popular Bug Lager, and topped with a crunchy pretzel and cracker topping and a parmesan wheel. A bowling alley might be a strange place to order some of the best mac and cheese in the state, but it is Portland after all. Baked with fontina and topped with Ritz crackers, the mac and cheese at Bayside Bowl is simple yet delicious. Darby’s Restaurant & Pub serves up regional and international comfort food in small-town Belfast. Everything is made from scratch using local produce when available. Their famous house mac and cheese is no exception. It even comes with a house salad so you can eat something green, too. Bar Harbor is home to many restaurants including the local favorite, Side Street Café. 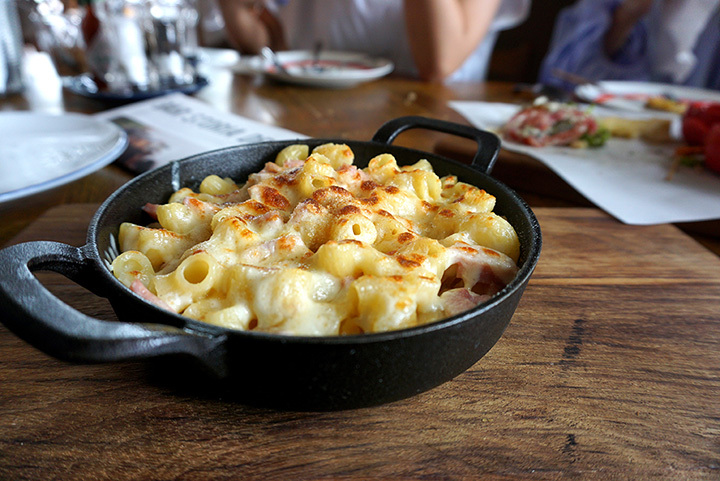 Side Street Café has its own mac & cheese menu giving you several options, like Jeff’s Mac & Cheese and lobster mac. If you can’t find what you like on the menu, you can create your own! Located in Waldoboro, but straight out of Germany, this restaurant and deli makes some delicious mac and cheese. They do carry some of the best artisan cheese this side of the Atlantic. The mac and cheese is creamy, delicious and topped with pretzel dust. With an extensive food menu and an even longer beer menu, it’s hard to find the mac and cheese on the Great Lost Bear menu. But if you look under “Bear Beginnings,” you’ll find their famous mac & cheese. If you’re brave, try their Buffalo chicken mac & cheese. Hero’s Sports Grill in Bangor is home to the famous “Hero’s Hit” Buffalo chicken mac & cheese. If you’re looking for a real Maine dish, try the Mainah Mac, which has red hot dogs mixed in it. Other favorites include the BLT mac & cheese and the steak mac & cheese. Silly’s is a long-time Portland favorite with a creative menu with even more creative names. Who can resist a mac and cheese named “The Empire Strikes Mac?” Choose from barbecue smoked pork, Buffalo grilled chicken or Buffalo tofu. It’s even served with pickled zucchini relish.